Toque & Canoe heads to Winnipeg to check out the freezin' season. In less than the span of a week, I went from Mexico, where it was plus 28 C, to Manitoba, where one evening it dipped to, oh, minus 43 with the wind chill. “Are you nuts? Winnipeg? In winter? !” people squeaked incredulously after hearing about my February travel plans. Good question: Why visit Winterpeg when most Canadians are desperately travelling south? I grabbed my parka(s) and headed into the heart of the Frozen North to find out. Over four action-packed days, I came to learn why this little big city’s fierce embrace of the freezin’ season makes it pretty hot stuff. After arriving in #YWG, I check into Mere, a new boutique hotel strategically located on the west bank of the Red River. Although its sleek, contemporary lines aren’t particularly maternal, I come to think of Mere, pronounced as in “merely,” more as “ma mère.” It’s the mothership I return to nightly to thaw out, burrowing into its thick, down duvets. Mere is walking distance (if the wind’s not howling) to the city’s attractions, including the Exchange District, Winnipeg’s original downtown. A national historic site with turn-of-the-last-century architecture, it’s being rejuvenated with retail, galleries and restaurants. At King & Bannatyne, a new restaurant in the neighbourhood that dishes up hand-carved, slow-roasted meat sandwiches, I tuck into a braised beef number slathered with aioli, the richness cut by the tang of a crunchy, freshly pickled cuke. 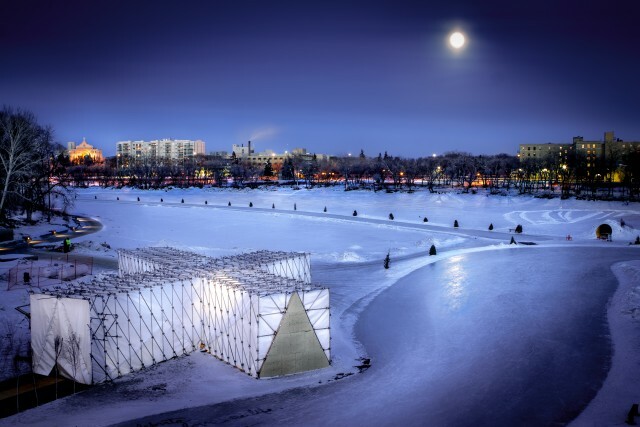 The city’s thriving food scene has captured international attention with RAW: almond, the world’s only pop-up restaurant on a frozen river. In a tent. In its third year, it runs over 21 days and features a different chef every two nights. Vikram Vij and Bob Blumer have cooked here. I have a ticket to the event’s last night. A breathtakingly icy wind wallops us as we walk from The Forks National Historic Site at the juncture of the Red and Assiniboine Rivers, down onto the frozen Red. But it’s toasty inside the cross-shaped tent, where we perch on fur-topped stumps at long tables. A duck confit and goat cheese perogy topped with duck pastrami and creme fraiche is the standout of his five-course feast. Best perogy ever. The atmosphere is madcap. RAW: almond co-founder Mandel Hitzer, the chef/owner of deer + almond, another acclaimed restaurant from the Exchange District, dashes about in a multi-coloured iridescent onesie and fur hat. Guests drop in and out of the open kitchen, which erupts into spontaneous song and clapping at one point— teeing up the ambience for an all-night wrap party. A guided tour via cozy bus is a great way to get the lay of the wintry land. Michelle Gervais, president of O Tours and a proud francophone, takes a group on a customized toot around town. We learn tons: how The Peg boomed from the late 1880s to 1920s, creating a whack of millionaires, beautiful, treed neighbourhoods and prominent architectural gems such as the Manitoba Legislative Building, topped with the naked, winged Golden Boy. We break for coffee and doughnuts at hipster central, Parlour Coffee, in the Exchange District. My latte is stellar and the handmade chocolate-dipped from Oh Doughnuts is to die for. Back on the bus, Michelle explains that First Nations peoples camped at The Forks area at least 7,000 years ago, that the fur trade brought Quebecois men, who married aboriginal women and created the Metis. As we cross the Esplanade Riel into the francophone district of St. Boniface, my rusty high-school history comes to life. Here is the tombstone of Metis leader Louis Riel in the graveyard of the Saint-Boniface Cathedral. Coming from Calgary, I love that Winnipeg’s rich heritage hasn’t been mowed down by development. With an average house price of $268,382, young people in this city of 720,000 can get into the market and creative types can afford to live here. This is apparent as our history lesson morphs into a food ‘n’ neighbourhood tour. We hit local fave, Segovia Tapas Bar and Restaurant, in the Osborne Village ‘hood, a great spot to shop for vintage clothing and rare books. Chef Adam Donnelly lays on pre-lunch snacks of salt-baked beets with trout roe and slices of buttery albacore tuna. 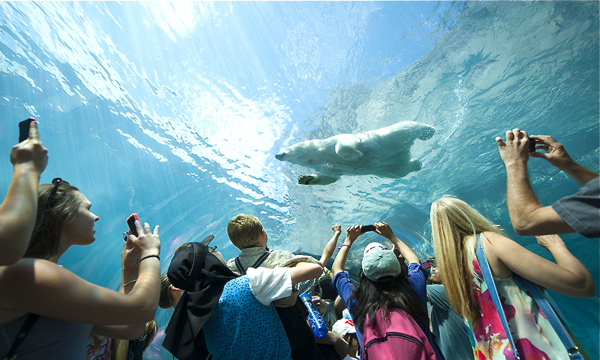 Layer of subcutaneous fat laid down, it’s time to brave the blasting north wind and visit “Journey to Churchill,” Assiniboine Park Zoo’s new exhibit of Arctic animals in naturalistic settings, opened in July 2014. Snowy owls, wolves and muskoxen happily cavort in the bitter cold. Winter’s the time to see them, as they wilt in summer. I’m wearing two pairs of wool socks, down-filled snow boots, long underwear (top and bottom), fleece pants, snow pants, a turtleneck and sweater, a thick down jacket, gloves and mitts, a hat with earflaps, all topped with a long parka — but I’ve got nothing on the polar bears, the real stars of this snow show. The huge beasts lumber on land but once they slip into the frigid water of their enclosure, they become aquatic ballerinas. A clear acrylic tunnel beneath their pool gives awestruck visitors a stunning view of their grace, power and rippling-furred beauty. I feel less conflicted about their confinement when zoo programmer Bran Adams explains that several of the bears were motherless cubs rescued from Churchill, where climate change is increasingly bringing bears into conflict with people. Another is a bad-boy bear who’d bitten someone and was given a stay of execution. That night, I do my own polar plunge at Thermëa, a new Scandinavian-style spa located 20 minutes from downtown. Here’s the drill: roast in a sauna or steam bath for 15 minutes, dip into a icy pool, then rest for 15 minutes around a campfire outside or recline on heated tile benches inside. Repeat until melty. If being surprisingly comfortable in a wet bathing suit, robe and flip-flops in sub-Arctic temps isn’t wild enough for you, an “aufguss” or infusion ritual ups the ante. The sauna meister — in this case a middle-aged Swiss-German clad in towel and plastic sandals — ladles water and snowballs infused with essential oils onto the sauna’s searing-hot rocks. Whirling a set of towels like a toreador, he distributes bursts of heat and nostril-clearing menthol to delighted sauna-goers. It’s transportive. I’d be a regular, given the mid-week entrance fee of $45 (you can stay all day). Every winter city needs one of these. In summer, tourists mob the The Forks’ many attractions, but I think the area is more magical this time of year. People carb-load in the market area — perogies! cinnamon buns! cheese blintzes! — before skating at the outdoor plaza or lacing up and tackling the Red River Mutual Trail. There are six kilometres of natural ice groomed on the Red when I visit; a series of whimsically-designed warming huts dots the trail, providing welcome winter shelter. That afternoon, I go by horse and wagon to the nearby Canadian Museum for Human Rights—a timely break from the biting cold. Opened in September 2014, Izzy Asper’s baby is a massive, modernist church-like structure wrapped around a central spire. The CMHR is devoted to the concept of exploring human rights through a Canadian lens. It has only about 300 artifacts on display, including a ballot box from the 1994 election of Nelson Mandela. Mostly, it offers stories, told through digital technology such as video clips, games and interactive displays. 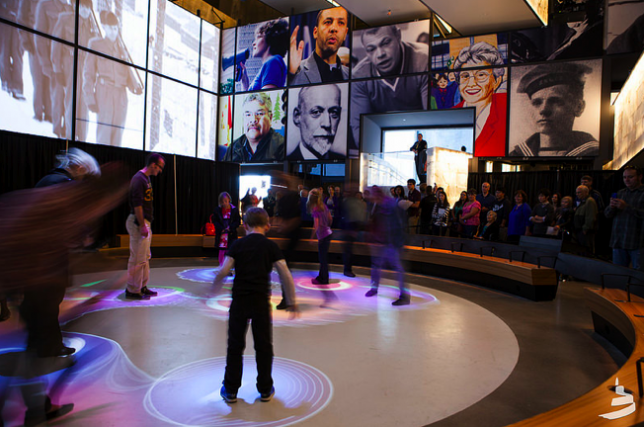 Flocks of schoolkids seem to be digging it, but the CMHR may challenge non-digital natives. I find it best to slow down and sip a bit at a time: the huge Circle Basket Theatre with a 360-degree film about aboriginal rights, an interactive “game” about Supreme Court of Canada human rights rulings and — here’s where the museum really hits its stride — a powerful gallery devoted to the Holocaust. The intensity of all that human sorrow and the cold conspire to wipe me out. Back at (ma) Mere I power-nap before the night’s revelry at Western Canada’s largest winter party. Bundled up again like little kids (whisk, whisk, go my snow pants), a group of us hits Festival du Voyageur, held within the walls of Fort Gibraltar and a celebration of all things franco-Manitoban. Bearded, buck-skinned, Hudson’s Bay-blanketed, fur-hatted folks crowd the Snow Bar tent, warming up with ice tumblers of caribou. Legend has it that hunters and trappers drank caribou blood cut with booze to ward off the cold, but the modern version contains heavily fortified wine. We toss our melting glasses on the straw-covered snow floor and stamp over to the Cabane à Sucre tent for tourtière and poutine. Dessert is tooth-achingly sweet maple syrup poured onto snow by volunteers from the community of St. Pierre and rolled up with a stick as it cools. Pure Canadiana. More than 130 bands play over 10 days of this huge kitchen party, now in its 46th year. We catch The Dead South, a bluegrass/folk band from Regina dressed like 19th century rogues, the high-energy foursome a hit with the sugar shack’s Millennial crowd. I cap the night with a speedy visit to one of the festival’s outdoor Port-a-Potties. It leaves me wondering: How quickly does exposed flesh freeze in minus 35? 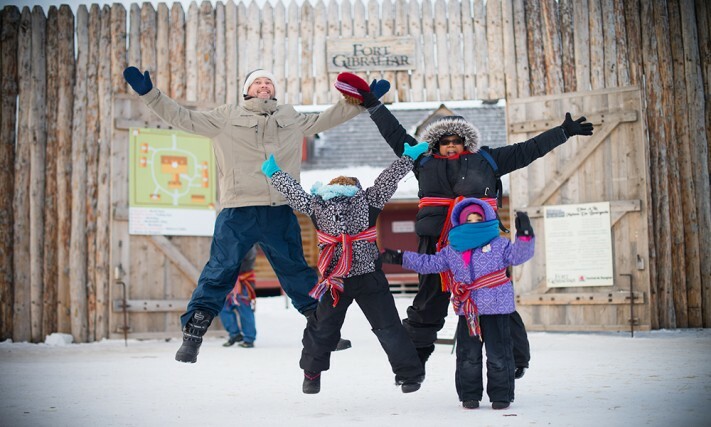 By day, the Festival du Voyageur is a more family-oriented, heaps-of-fun kind of place. There’s tobogganing, beavertails and an international snow-sculpting competition featuring shivering artists from as far away as Mexico, Argentina and Spain. Fort Gibraltar’s cabins and costumed interpreters re-create life as it was in 1815 during the fur trade. The trading post and blacksmith shops are excellent, but a young Metis woman quietly sewing a beaded hood in another cabin captures my imagination. “Angelique” is fur trader Jean-Baptiste Lagimonière’s country wife, an informal situation in which voyageurs “married” aboriginal women. “We have a lot of children. And I have to help Marie-Anne, his real French wife, adapt to life here,” Angelique tells me bitterly. I digest Angelique’s situation over a French-Canadian lunch of pea soup, beef stew and luscious sugar pie at Maison du Bourgeois, the fort’s restaurant. It fuels me for the afternoon and evening activities on my last day: snowshoeing along the east bank of the Red River (cold), a yoga flow class at Yoga Public (hot), dinner at Carbone Coal Fired Pizza (hot) and cocktails at the new Igloo Ice Bar at Rudy’s Eat and Drink (equal parts hot and very cool). Goodbye and au revoir, Winnipeg. It’s been a blast. Way to rock winter. Our writer was a guest of Tourism Winnipeg and Travel Manitoba. This story was not reviewed or approved before publication. Nice job capturing the essence of a Winnipeg winter. No sugar-coating the cold truth, but even in sub-zero, there’s a lot going on in my hometown. Cheers! There IS a lot going on in your hometown. Lots of youthful, creative energy and a sense of pride in Winnipeg’s traditions. It’s a compelling combo. I am not a huge lover of cold places, but Manitoba seem magical! There so many interesting activities there, Valerie!